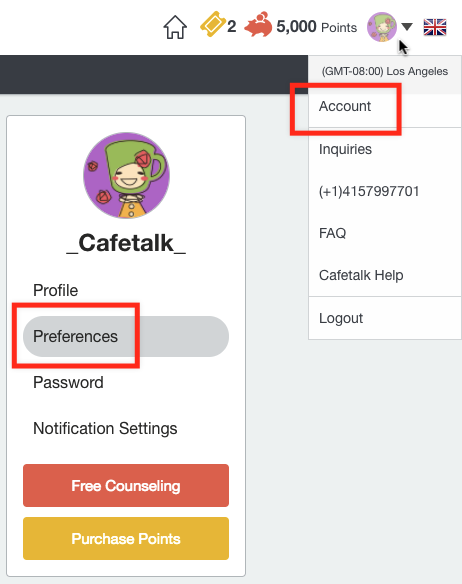 If you have an alternate email address where you would also like to recieve Cafetalk emails, you can set that as your "sub-email". Please note: You cannot use your sub-email as your ID when logging in. From your dashboard, click on "Account," which will take you to the Preferences page. Add the email address you'd like to set as your sub-email. Click the green "Update Settings" button at the bottom of the page. *What's the difference between sub-email and reminder email? If you set a sub-email, we will send notification emails to both your login email and your sub-email address. If you set a reminder email, we will only send lesson reminder emails to your reminder email address and not your login email address.